Rafienia, M., Imani, R., Hojjati Emami, S., Rabbani, M., Kabiri, M. (2008). Synthesis and Characterization of Biodegradable Hemostat Gelatin Sponge for Surgery Application. Iranian Journal of Pharmaceutical Sciences, 4(3), 193-200. Mohammad Rafienia; Rana Imani; Shahriar Hojjati Emami; Mohsen Rabbani; Maryam Kabiri. "Synthesis and Characterization of Biodegradable Hemostat Gelatin Sponge for Surgery Application". 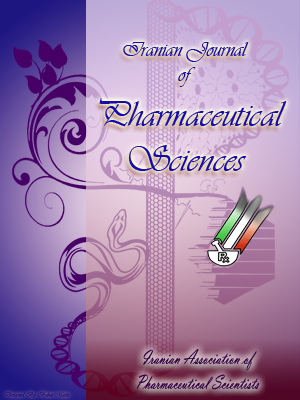 Iranian Journal of Pharmaceutical Sciences, 4, 3, 2008, 193-200. Rafienia, M., Imani, R., Hojjati Emami, S., Rabbani, M., Kabiri, M. (2008). 'Synthesis and Characterization of Biodegradable Hemostat Gelatin Sponge for Surgery Application', Iranian Journal of Pharmaceutical Sciences, 4(3), pp. 193-200. Rafienia, M., Imani, R., Hojjati Emami, S., Rabbani, M., Kabiri, M. Synthesis and Characterization of Biodegradable Hemostat Gelatin Sponge for Surgery Application. Iranian Journal of Pharmaceutical Sciences, 2008; 4(3): 193-200. Production and characterization of soft cross-linked gelatin sponge by using glutaraldehyde for blood hemostasis application, is the goal of this study. Biodegradable hydrogels were prepared through crosslinking of gelatin with glutaraldehyde followed by freeze drying. The effects of gelatin concentration, amount of crosslink agent and freeze drying temperature on mechanical properties and elasticity, stability and degradation rate, swelling and water absorption ability, hemostatic effect and cytotoxicity were investigated. As the freezing temperature was lowered, the density of freeze-dried sponges increased. Density of samples is strongly dependent on the freezing temperature before freeze-drying. The addition of GTA as cross linker agent changed density very slightly, but no direct relationship between the amount of cross linker and the density was observed. Gelatin sponges prepared by freeze-drying after freezing at -10 and -25 ºC had large pores. Network structure of heterogeneous pores. The rate of weight loss decreased with increasing degree of crosslinking of the samples, and the higher degree of cross-linking in gelatin sponges causes more resistance to degradation in PBS solution. Gelatin concentration increase had very sharp effect on raising the compression module, and freezing temperature changed inner structure of sponges and can affect mechanical behavior. Hemostasis and blood clot formation are of primary concern in the surgery. In even simple extractions, rapid clotting helps to prevent infection and initiates the process of tissue repair and healing. Absorbable materials which aid hemostasis and can be used to accelerate healing have advantages in surgery. Proper handling is essential to control bleeding and only the required amount should be used, even though the hemostat is expected to dissolve promptly. A dry local hemostat absorbs several times of its weight and expands postoperatively. Therefore, when an absorbable hemostatic agent is retained on or near bony or neural spaces, the minimum amount should be left after hemostasis is achieved. Minimum inflammation without strong foreign body reactions or blockade of healing is desirable after the use of local hemostats. Local hemostat can be used to arrest suture hole bleeding and bleeding from the cross-sectional surface of parenchymatous organs such as liver and spleen . Table 1. Range of variable parameters. Recently, gelatin is known to contribute activation of macrophage and a high hemostatic effect. Gelatin is, practically, more convenient than commercially used collagen because a concentrated collagen solution is extremely difficult to prepare from native collagen and thus gelatin is far more economical than the collagen [2-4]. Among other aldehydes which are used in protein matrix, glutaraldehyde (GTA) is advantageous, for its rapid reaction, low price, availability, high solubility in aqueous solution, and its reaction with a large number of available amino groups present in gelatin structure . However, the reaction of GTA with proteins is highly heterogeneous and complicated and nonreacted aldehydes may be released and cause toxic effects . In general, sponge-type hydrogels have been produced using the freezing technique and are currently utilized as wound dressings. Figure 1. Reaction of gelatin with glutaraldehyde. drying procedure. The freeze-drying technique has been widely adopted in pharmaceutical and food industries, because this technique provides increased stability or rapid solubility in many applications, such as drug delivery including site-specific and antibiotic delivery systems. In this study, a combination of the porogen method, using only water as a solvent, and the freeze-drying technique is introduced to produce highly porous scaffolds from biodegradable gelatin. An alkaline-processed gelatin with pH 4-7 and theoretical molecular weight of 100000 was purchased from Merck Company. It is composed of glycine (27%), proline and hydroxyproline (25%), glutamic acid (10%), arginine (8%), alanine (9%), aspartic acid (6%) and other amino acids (15%). Glutaraldehyde was also Merck Co.
Porous, freeze-dried gelatin sponge was prepared by three main procedures including crosslinking, swelling, and lyophilization. Preparation method is schematically illustrated in Figure 2. Briefly, gelatin solution is prepared by solving gelatin in double-distilled water at 50 ºC. GTA aqueous solution was added to the aqueous solution of gelatin to give the final concentration. The solution mixture was poured into a suitable mold. Molded gelatin should be left for 2 h at room temperature for crosslinking and then stand for 12 h at 4 ºC for gelation. Gelatin hydrogel was further washed thrice with double-distilled water for removing non-reacted residues of GTA. The fully hydrated hydrogel was frozen at different temperatures for 5 h. Then, the frozen hydrogel placed in a Petri dish, lyophilized with a freeze-dryer (ALPHA 1-2 LD) for 24 h in order to completely dry. The frozen hydrogels should be transferred from their freezing apparatus to the freeze-dryer with care to avoid melting of the frozen samples. We changed three parameters in preparing samples: Concentration of gelatin, concentration of GTA in final product and freezing temperature (Tf) as considered in Table 1. Code of each sample involved these three parameters, respectively (G%, GLA%, Tf). For comparing and evaluation of synthetic samples, we utilized a trade mark absorbable gelatin sponge (Curaspon™). The density of sponge was calculated from the ratio of weight of the freeze-dried hydrogel to its volume. The density measurement was performed using samples with a volume of 1×1×1 cm³ and the final densities were obtained from the mean of three specimens. Figure 3. SEM micrograph of gelatin sponge (×100) a: 1,0.5,N2 (cross); b: 1,0.5,N2 (surface); c:1,0.5,-10 (cross); d: 1,0.5,-25 (cross). Table 2. Average density of gelatin sponge. The morphology of sponges were examined using a scanning electron microscope (SEM) after coating the samples with a thin layer of gold under vacuum at 15 kV. In addition, sponge's structure was viewed by optical microscope for better observation of pore structures and pore interconnections. Wf is final weight of sponge after freeze drying and Wi is initial weight of sponge. Figure 4. Degradation of samples in room temperature (shorter column) and physiological condition. An established cell line of L-929 mouse fibroblasts was used for evaluation of cytotoxic potentials. Sponges in cut shape were sterilized by immersing in 70% ethanol and then freeze dried for 24 h. Image of cells after 1 week represented cell viability in contact with gelatin crosslinked sponge. Samples for this test prepared in cylindrical shape (2 cm height, 1 cm diameter). Stress-Strain data were recorded for compression mode by rate of 1 mm/min by using HCT-25/400 Zwick/Roell. Then the curve was plotted by MATLAB software. The Young's compressing modules (Ec) was calculated by measuring the slope of the first linear part of Stress-Strain curve. Hemostasis ability by fragility of RBC membranes in contact with absorbable gelatin sponge was investigated according to the ASTM-F75600 . Samples were cut into appropriate pieces (3 cm²) and then transferred to polyethylene tubes. One ml of whole blood was added to tube and diluted by 7 ml phosphate buffer. The solutions were then incubated at 37 ºC for 15 min. Following this, they were centrifuged at 800 rpm for 5 min. The supernatant was then taken for hemolysis studies. Absorbance at 540 nm was determined using Milton Roy Spectronic 601 spectrophotometer. Table 3. The physical properties of freeze-dried gelatin hydrogels following freezing at-10 and-25 ºC and in N2 [l]. The density and appearance of dried sponges are listed in Table 2. As the freezing temperature was lowered, the density of freeze-dried sponges increased. Density of freeze-dried sponges obtained by freezing in N2 (liquid) was almost thrice as high as that by freezing at -25 or -10 ºC. The results indicated that the density of samples is strongly dependent on the freezing temperature before freeze-drying . The addition of GTA as cross linker agent changed density very slightly, but no direct relationship between the amount of cross linker and the density was observed. Gelatin sponges prepared by freeze-drying after freezing at -10 and -25 ºC had large pores which were visible noticeably, as shown in Figure 3(a, d). SEM observation of these sponges demonstrated a network structure of heterogeneous pores. However, homogeneous small polygonal pores were observed by freeze-dried samples after freezing in N2 [l]. The extent of crosslinking determines the stability of biodegradable material and it can be evaluated by measuring the time required for complete solubility. The amount of dissolved gelatin can be used in the quantification of matrix degradation . Degradation profiles of gelatin sponges are given in Figure 4. The rate of weight loss decreased with increasing degree of crosslinking of the samples. This indicates that the higher degree of crosslinking in gelatin sponges causes more resistance to degradation in PBS solution . The gelatin degradation is so sensitive to temperature. By increasing temperature degradation rate raises. Effect of pore structure is not significant and by increase of freezing temperature degradation rises slightly. In this study, we changed GTA concentration in the range of 0.2-1.5 wt %. The microscopic examination does not illustrate any significant cytotoxicity in tested samples compared to control (polystyrene Petri dish) and trade sample. The results are shown in Figure 5. Figure 5. Microscopic examination of cell after 1 week exposure to gelatin sponge: a:1,1.5, N2 (×200); b: 1,1.5, N2 (×400); c: control (-) (×200); d: trade sample(×200). Figure 6. Mechanical analysis of gelatin sponge. The compression modules of gelatin sponges (Ec) are given in Figure 6. Gelatin concentration increase had very sharp effect on raising the compression module. Sponges with 3% gelatin were hard and stiff. By decreasing gelatin concentration, sponges became soft and flexible. On the other hand, the compression module value did not demonstrate a significant change upon varying the amount of GTA . Freezing temperature changed inner structure of sponges and can affect mechanical behavior. Figure 7 shows the results of hemolytic experiments. The y-axis represents absorbance values at 540 nm . Higher absorption value represents more hemoglobin release and so more hemolytic ability of samples. As it is shown, the absorption ratios of all samples are higher than control (+). Sample with 2% gelatin shows strong hemolysis that confirms gelatin exhibit hemostatic effect by nature. A change in the amount of cross linker has not significant effect on hemolytic ability. Open pores with inner connection allow blood enter sponge rapidly at initial 30 min. Comparison between samples (1, 0.5,-25) and (1, 0.5, N2) confirms this point. Figure 7. Hemolytic behavior (15 min.) of samples. The strength and stability of gelatin sponges, used in surgery must satisfy their intended biomedical needs. Crosslinking of gelatin sponges with GTA provides a means of easily tailoring a sponge biostability and mechanical properties. These techniques may be used to increase ease of handling in general. Based on these results, intermediate concentrations of GTA, specifically 0.5% increase gelatin sponge strength and stability while it has no cytotoxicity effect. These advantages may contribute to improved performance in surgical application of the sponges. Tomizawa Y. Clinical benefits and risk analysis of topical hemostats: A review. J Artif Organs 2006; 8: 137-42. Bigi A, Cojazzi G. Mechanical and thermal properties of gelatin films at different degrees of glutaraldehyde crosslinking. Biomaterials 2001;22: 763-68. Hong SR, Lee SJ. Study on gelatin-containing artificial skin IV. Biomaterials 2001; 26, 961-68. Ulbayram K, Aksu E. Cytotoxicity evaluation of gelatin sponges prepared with different cross-linking agents. J Biomater Sci: Polym Ed 2002;13: 1203-19. Matsuda S, Iwata H, Y.Ikada NS. Bioadhesion of gelatin films crosslinked with GA. J Biomed Mater Res 1999; 45: 20-7. Vijayanand K, Deepak K. Interpreting Blood-biomaterial interactions from surface free energy and work of adhesion. Trends Biomater: Artif Organs 2005; 18: 73-84. ASTM.F756-00: standard practice for assessment of hemolytic properties of materials. Choi YS, Hong SR. Study on gelatin-containing artificial skin: I. Biomaterials 1999; 20: 409-17.